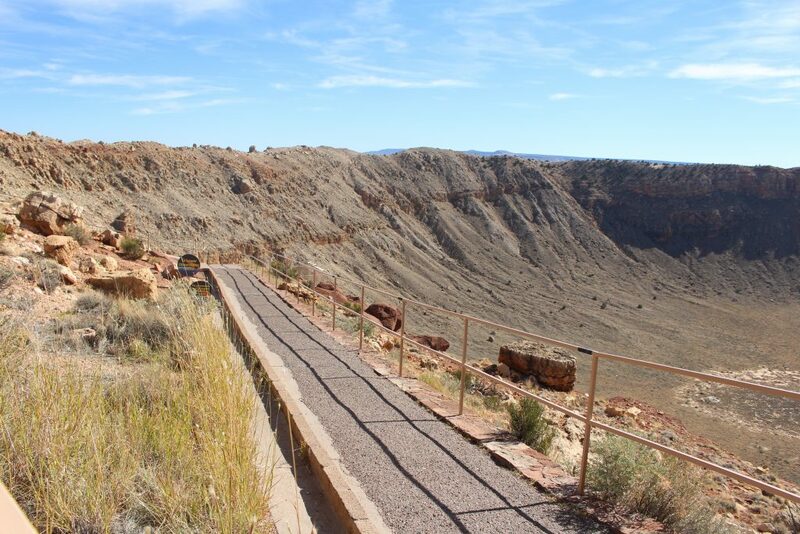 Located few minutes from the historic Route 66 and by Interstate 40 in Winslow, Northern Arizona lies a giant hole. 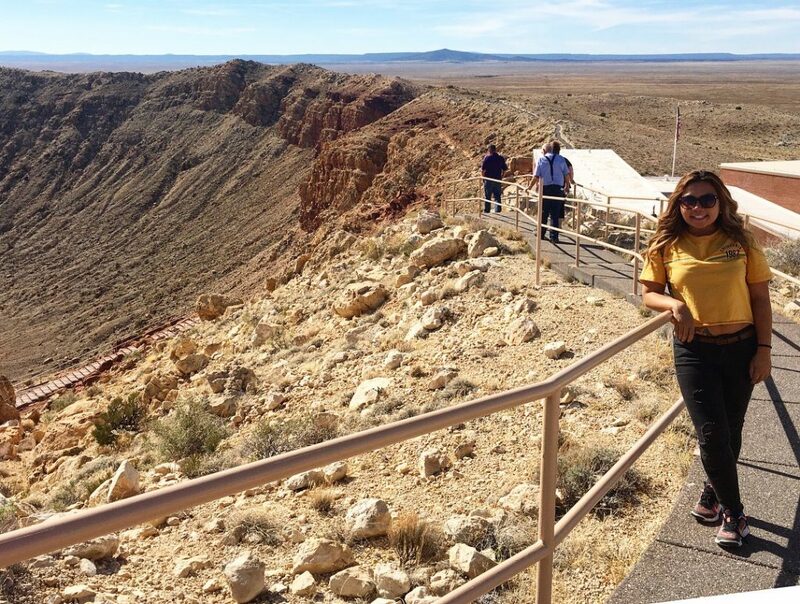 Yeah, a giant hole, but not just a plain giant hole… it’s a meteor crater. 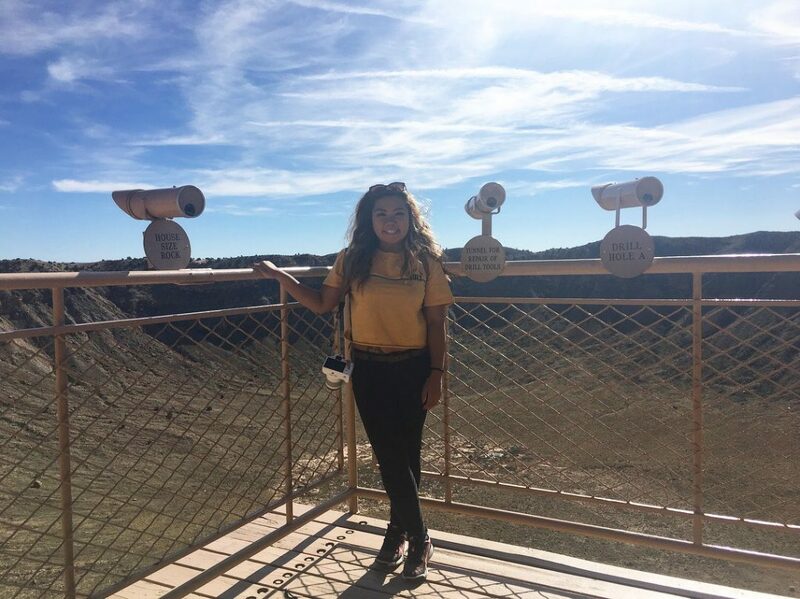 Instead of singing “Well, I’m standing on a corner in Winslow, Arizona” (reference to an Eagles’ song), when you see this hole, you’ll be singing “Well, I’m standing on a corner of a meteor crater in Winslow, Arizona”! 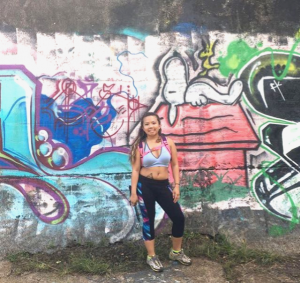 Last month, I went on yet another road trip with my parents. 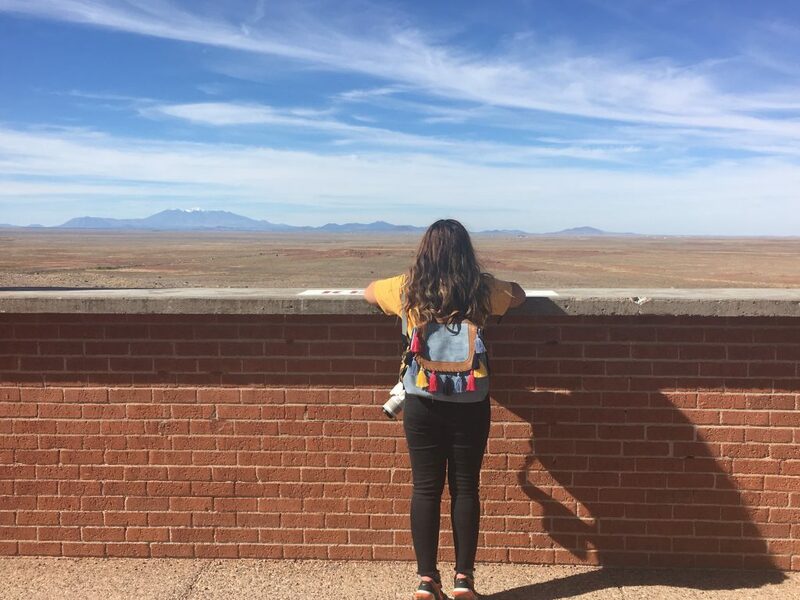 Last time I visited Arizona in May, I have always wanted to see the meteor crater but with all the other places I got to see in Arizona and the limited time I had for just a week, I wasn’t able to and the place seemed like a far away dream. This time, since I’ve been living here from the end of September, I had more time and more opportunities to explore this beautiful state that I love (after all, a lot of my blog posts do take place here). 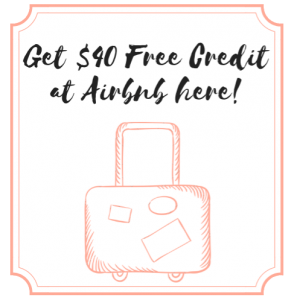 Our original weekend road trip itinerary included visiting Petrified Forest National Park first but I think this actually worked out… we had to stop by a gas station to fill gas into our car. 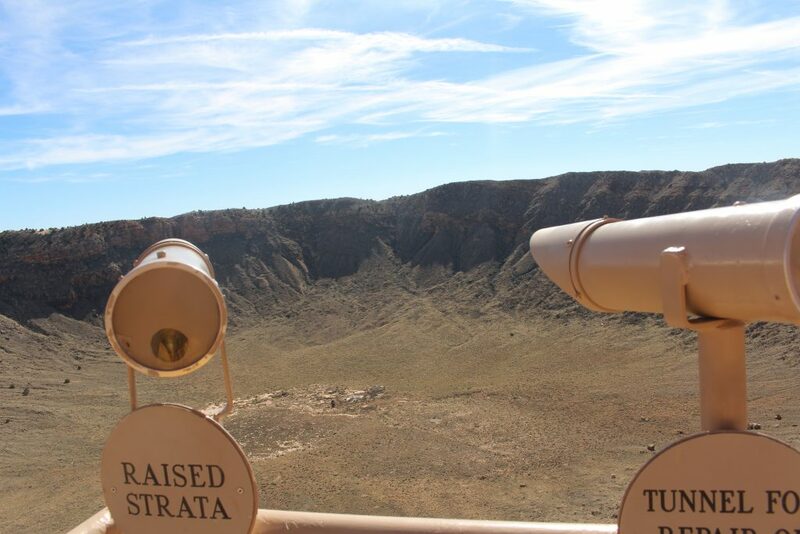 The gas station we stopped by had a huge sign by it advertising that the Meteor Crater was just a mile away. We were actually in Winslow. So, we ended up going there first than the national park. A drive through a long road in the desert that actually may look like another place in the middle of nowhere takes you to a building that almost looks like a school building and a parking lot on a slight hill. You pay for your admission fees and the workers will direct you to the back of the building and outside. Once outside, there is a cool open viewpoint of the highway we drove on and beyond and it looks like you’re looking through a painting. 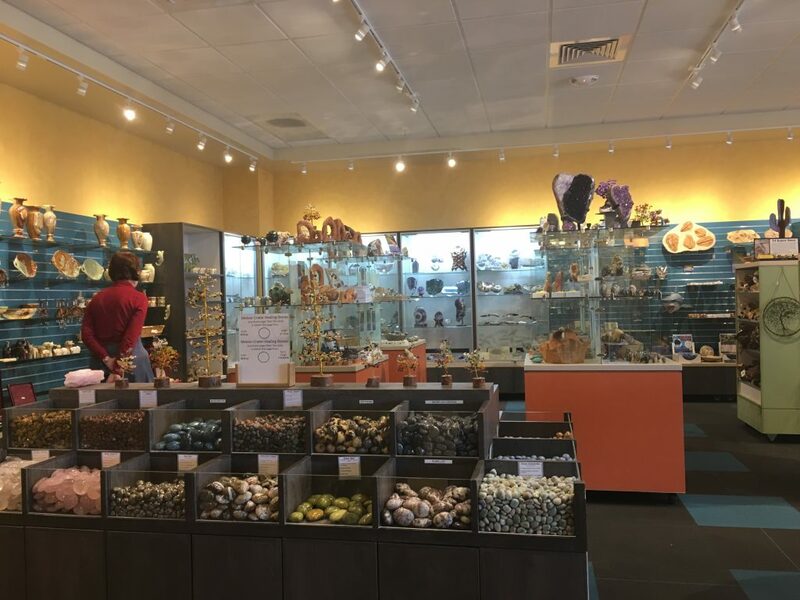 And after passing the gift shop, you head through another room, which has the museum in it and a room to watch a short movie on the meteor crater. We watched the movie after seeing the meteor crater. 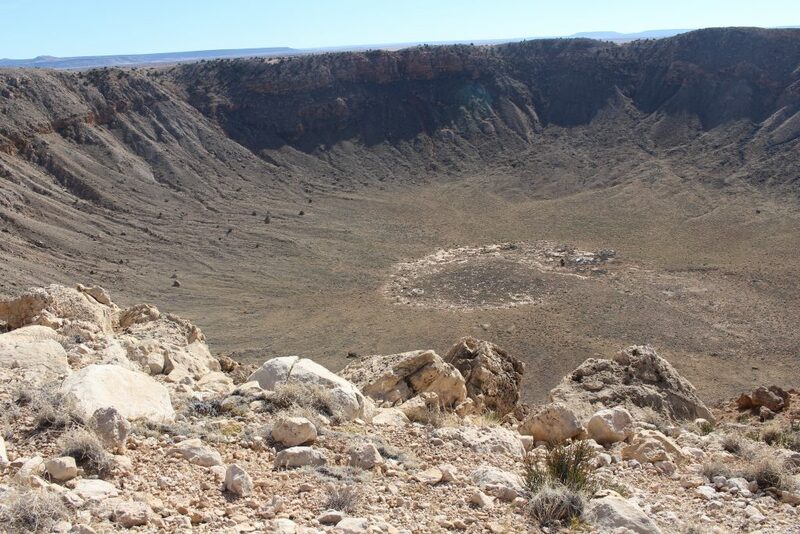 Here are some fun facts about the meteor crater! The speed of the impact of the meteorite is debatable but according to the short documentary movie I watched, it flew at about 26,000 miles fast (imagine if you were flying from Los Angeles, Cali to New York City in just 5 minutes). This meteor crater was created about 50,000 years ago during the Pleistocene epoch, a time of the last glacial period. It is estimated that it is a 30-50 meter (in diameter) nickel-iron meteorite that created the impact. 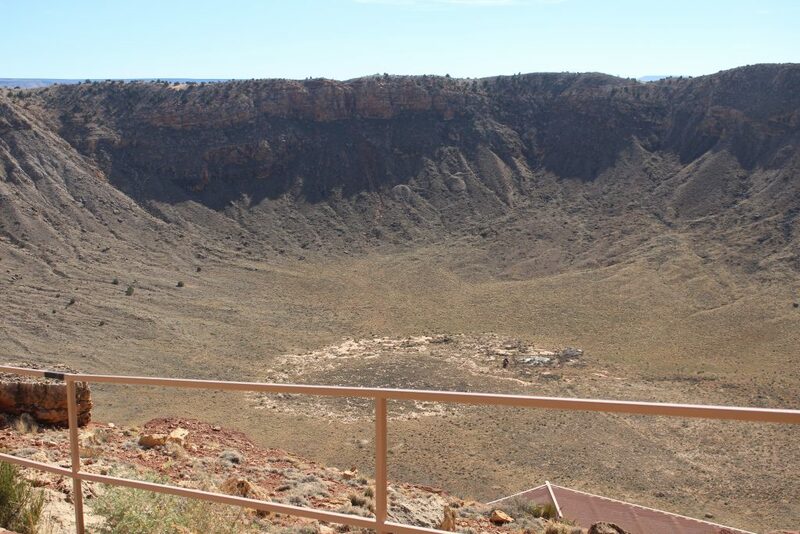 To imagine how big the meteor crater is, it is as big as 20 football fields, 1 mile in diameter, and 570 ft deep. 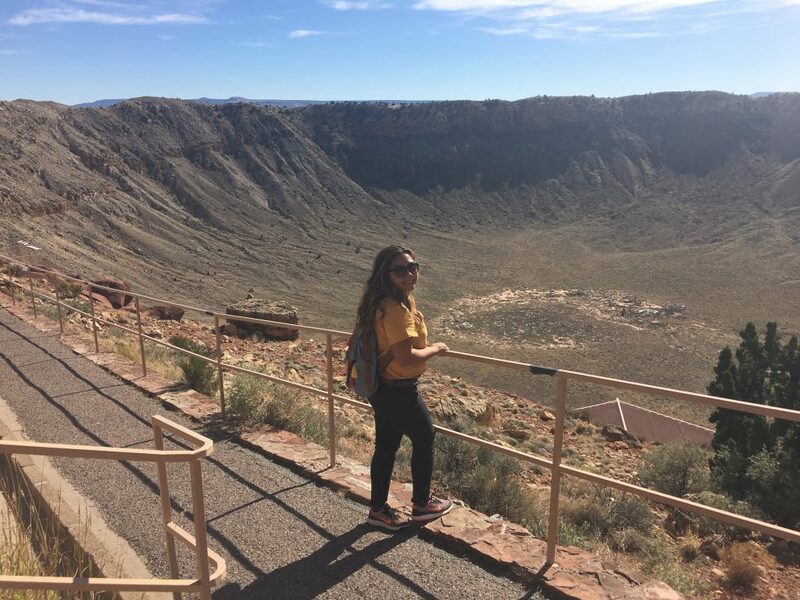 It is known as the best preserved meteor crater on Earth because of the lack of erosion that preserved its shape pretty well. 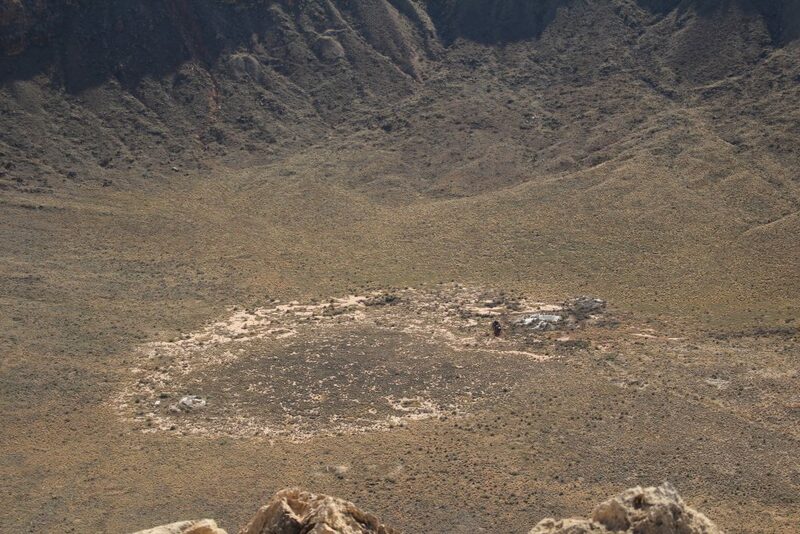 The meteor crater was once debated to be a volcanic steam explosion. It is named after Daniel Barringer, the first person who suggested that the discovery was a meteorite impact. His company put a mining claim to the land and Theodore Roosevelt signed the land patent. Although the place could look like it’s a national monument, it is a national landmark. The crater and this tourist attraction company is privately owned by Barringer’s family. 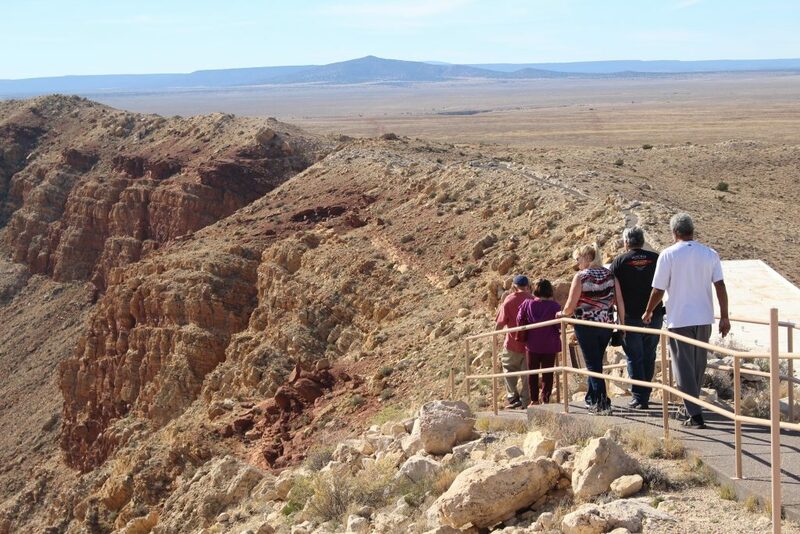 The geological features from outside the meteor crater are layers of stones that are formed on top of each other and those are the Coconino Sandstone, Toroweap Formation, Kaibab Formation, and Moenkopi Formation. 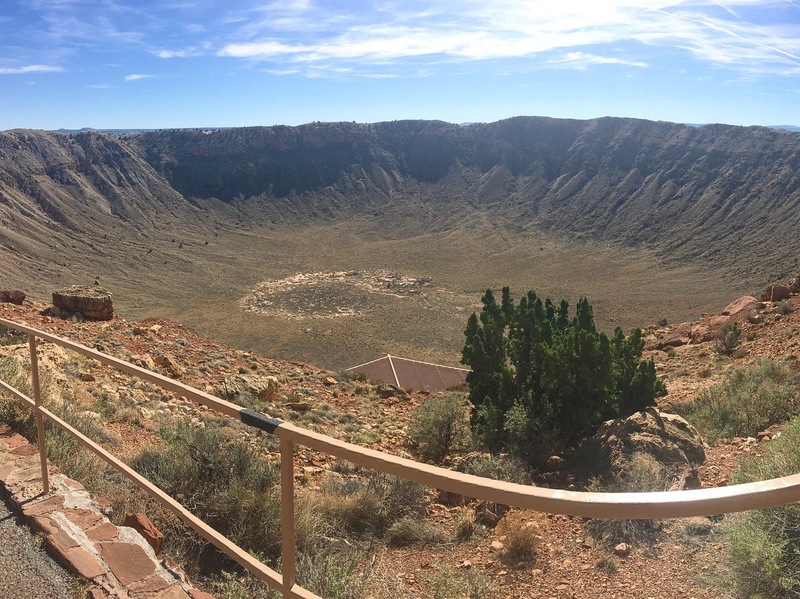 The meteor crater is impressively massive to your eyes and looks a lot deeper than described. 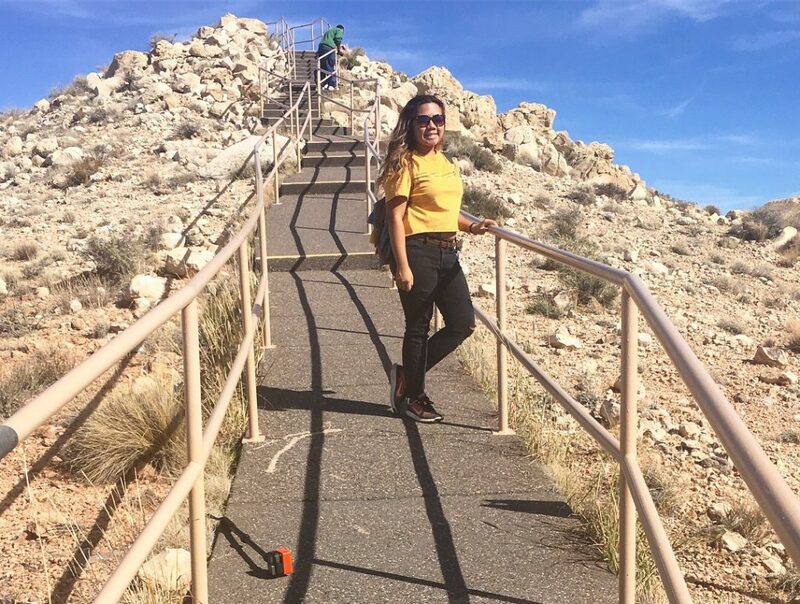 To get a better view of the meteor crater from up top, the place offers stairs to a deck around the rim and there are tower viewers. 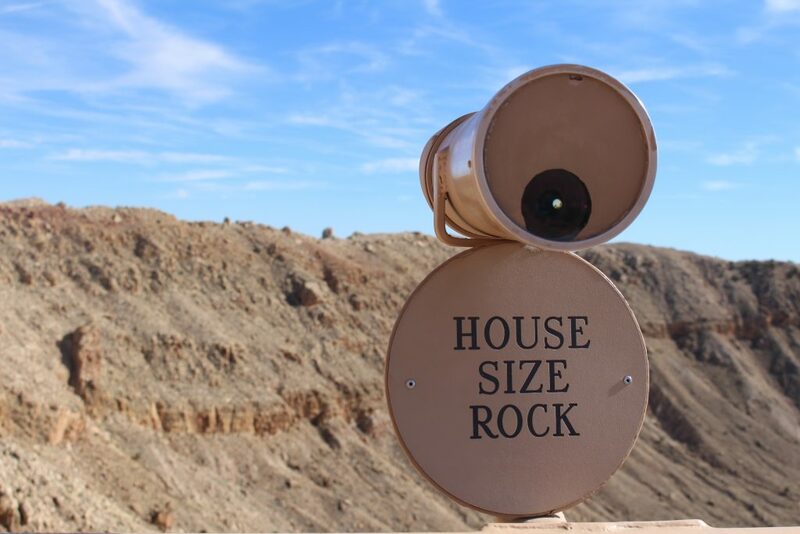 There is also a lower level deck with more tower viewers and they zoom in particular objects from the top and bottom of the meteor crater such as a fake display of an astronaut and an American flag and a rock that is, apparently, as big as an average house. 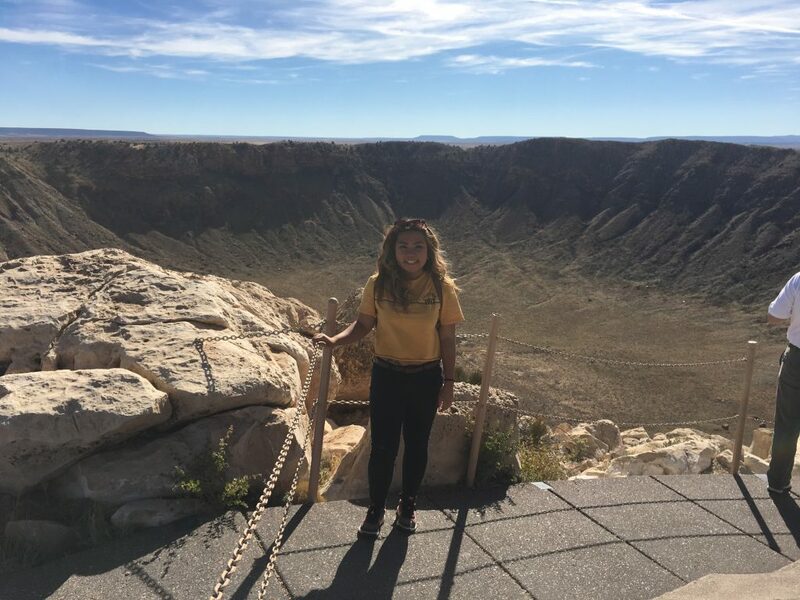 There is an interactive museum that you should visit when you see the meteor crater, featuring more of the history on it and samples of the meteorite fragments. Also, don’t forget to check out the gift shop with cool items of the meteor crater branded on them and more fun geological themed trinkets.